Ignoring air traffic and winds, the diagram below illustrates the shortest flight path from Newcastle to Cape Town. To take the shortest flight route, follow an initial heading of 163° south from Necastle Airport in England (55°02'15"N 01°41'30"W), and then travel 10050km until you arrive at Cape Town International Airport (33°57'53"S 18°36'06"E). 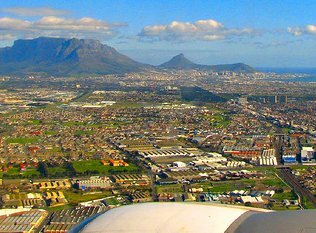 The London to Cape Town flight route is more competitive than the Newcastle to Cape Town flight route, and if you can fly from Newcastle to London cheaply, it may be worthwhile to fly from London to Cape Town. Johannesburg's OR Tambo International airport is the busiest hub in South Africa, and flights to Johannesburg are relatively cheap - so sometimes it's cheaper to fly from Newcastle to Cape Town via Johannesburg. Check the prices of combinations of flights from Newcastle to Johannesburg and flights from Johannesburg to Cape Town (Kulula, Mango and 1time are all low cost carriers with which one can cheaply fly from Johannesburg to Cape Town). Alternatively travel from London to Johannesburg, and then from Johannesburg to Cape Town.